Why more companies do not conduct safety perception surveys. Why more companies do not conduct safety perception surveys. Why more companies do not conduct safety perception surveys. President, Compass Health & Safety Ltd. In reference to safety perception surveys, Dan Petersen was once quoted as saying “I have no idea why the concept is such a hard sell”. As most readers know, Dan Petersen was one of the most respected health and safety professionals to ever work in the profession. He was a big proponent of safety perception surveys and frequently expressed frustration on the lack of acceptance of the technique as a measurement option. On numerous occasions Dan stated that his research and the research of other leading professionals, confirmed that surveys are a better predictor of safety performance than other methods of measurement commonly used by safety professionals. Since Dan Petersen’s passing, little has changed. At Compass Health and Safety Ltd. we share Dan’s frustration and offer the following explanation or answer to Why more companies do not conduct safety perception surveys. Fear is probably the greatest reason why more companies do not conduct safety perception surveys into their measurement toolkit. Simply put, decision makers fear the survey findings. In the survey process, employees have the opportunity to share or reveal much more than some managers would like as there are no sharing restrictions. Other methods such as health and safety management audits filter employee perceptions through an auditor who is tasked with abiding strictly to audit criteria. Many key perceptions shared with auditors in the interview process cannot be incorporated into the audit report. As a result, much of the benefit auditors could obtain from the face to face communications with employees is not shared and therefore some management view auditing as a much less risky measurement alternative. Here is an example of the how fear can influence management’s survey decision. Compass was asked by the safety staff of a large international employer, to help them conduct a safety perception survey. After meeting with the safety group and constructing an appropriate survey, a meeting was scheduled to meet to discuss the survey content with the senior management of the company. After the VP of Operations read the questions he promptly declared that he had some problems with the questions. When asked which questions he would like removed or reworded, he responded that his discomfort was more with the employee perceptions they may receive as well as the expectations that they would all be dealt with. Needless to say that was the end of the survey for that company. 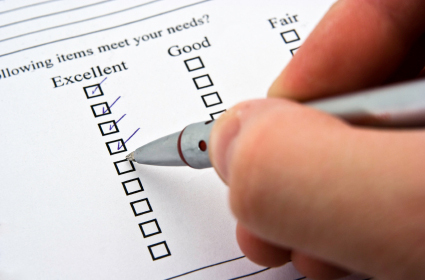 Many safety excellent companies use safety perceptions surveys as part of their continuous improvement process. These companies are measurement happy and do not fear the findings of this or any measurement technique. They understand the importance of getting input directly from the people in their company that knows – their employees. It is the employee input resulting from this process that reveals to them the actions they need to take in order to continue to improve. The cost associated with conducting safety perception surveys is another reason why more companies have not conducted them. The surveys are most frequently administered by consultants who often charge very high fees. Unfortunately there are few consultants offering these services and therefore their fees reflect this reality. The Compass Health & Safety Ltd. book “Yes you Can – conduct your own safety perception survey,” was written to help guide employers on how to conduct their own survey. When the survey process is followed as outlined, the survey measurement technique becomes one that is affordable to all employers. Data management is another reason why companies do not conduct safety perception surveys. Companies that have attempted to conduct surveys without first having the ability to manage the data, have failed in their survey attempts. In order to assess survey data, one needs a program that can sort the data in many ways such as by supervisory/non-supervisory, by job, position, location, etc. Existing available free survey resources found on the internet do not offer the reporting capabilities needed to properly assess survey data. For this reason Compass developed a web-based survey application that any company can use to help them conduct their own survey. The application is flexible allowing users to select survey questions/statements from a master question list (consisting of 160 statements) or, they can input their own questions. The application allows the user to establish their own reporting requirements so that the data can be sorted in a manner that works best for them. Finally, to facilitate analysis, the user has the ability to select from many different types of reports. Lack of knowledge is another reason why safety perception surveys are not used more often. Let me elaborate using the following example. In order to understand the present sometimes it is useful to examine history. It was approximately 100 years when Band-aid Bob came down from the mountain with two tablets containing basic health and safety elements. These tablets listed the elements (such as inspection, investigation, etc.) that at the time they were considered to be the key to achieving health and safety excellence. To measure the elements they created an audit instrument that to this day is used ubiquitously to assess safety performance. It is true that the belief in these elements and measurement processes resulted in some degree of safety improvement for employers, but generally they failed to help companies achieve the elusive goal of safety excellence. Research and evidence from safety excellent companies have demonstrated repeatedly that Band-aid Bob’s key elements do not necessarily lead to safety excellence. While the elements chiseled into the his two tablets may represent a good basic framework for safety, there is general agreement among health and safety professionals and researchers, that there are other key health and safety excellence factors that influence good safety performance. In other words, there are more tablets containing information pertinent to further improvement that have yet to be communicated. Most health and safety management system courses are reconstructed from principles established many years ago. Few have delved into more recent research and incorporated the learning into present course curriculums. As a result, many decision makers simple are not aware that there are other key performance factors that need to be assessed and that there are alternative measurement techniques available to assess them. The preceding explanation helps puts Dan Petersen’s “why the concept is such a hard sell” into perspective or why more companies do not conduct safety perception surveys. The research praises the benefits of the measurement technique. Safety excellent companies use surveys to help them continue to improve. The approach is feared by many managers because it is such a revealing performance indicator. Safety perception surveys have been made affordable through the “how to” approach. Software is now available to help users manage the data. What more needs to be done in order for this method of measurement to gain widespread acceptance?